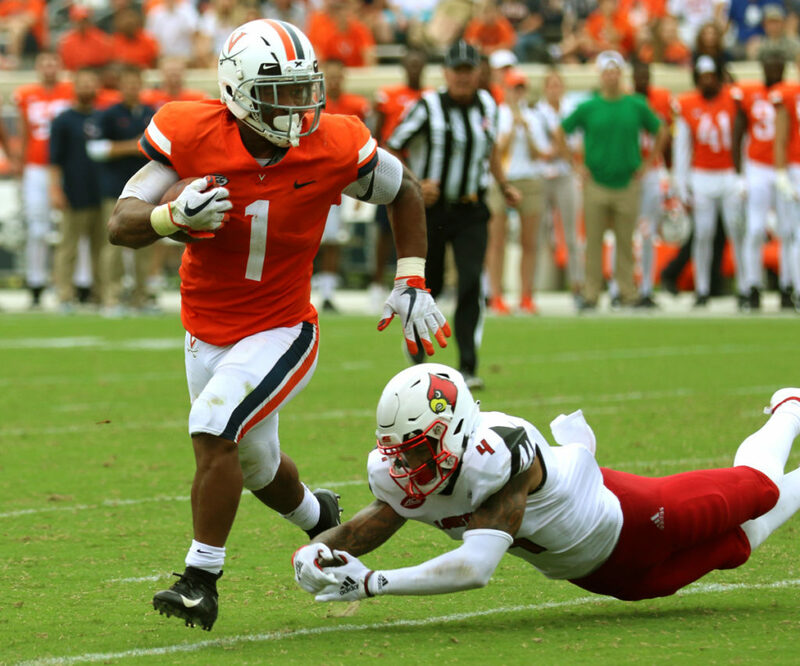 The University of Virginia football program will host the high-scoring Liberty Flames in a non-conference battle on Saturday, November 10. Kickoff for what will be UVA’s final home game of the 2018 season is 3 p.m. This will be the first-ever matchup between the two in-state programs. Virginia (6-3, 4-2) saw its 3-game winning streak, one that earned the Cavaliers the No. 25 spot in the initial College Football Playoff rankings, snapped last Friday night at home with a 23-13 loss to Pittsburgh. The Cavalier defense played well enough to win; however, the offense couldn’t establish any sort of rhythm as the Panthers held the Hoos to its lowest rushing (44 yards) and scoring output of the season. The Pitt game was costly in other ways as well, as Virginia saw three starters go down with injuries. Defensive lineman Mandy Alonso, who had become one of the defense’s best players, is out for the year (season and postseason), Coach Mendenhall revealed on his radio show. Safeties Juan Thornhill, Joey Blount and Brenton Nelson are banged up. Mendenhall says Thornhill may play, while Blount is likely out and Nelson is doubtful. A thin Virginia defense is tasked with slowing a Liberty team had a winning streak of its own snapped on November 3 with a triple-overtime road loss to U-Mass. The Minutemen’s 62-59 win dropped the Flames to 4-4 overall, 2-2 in games decided by 10 points or less. Offensive coordinator Joe Dailey’s fast-paced offense features a high-octane passing attack led by quarterback Buckshot Calvert, who has thrown for 2,528 yards with 18 touchdowns and 11 interceptions this season. Liberty is averaging 477.4 yards of offense – 323.9 yards passing – and 36.9 points per game in its first season on the FBS level. The Flames have scored 40 points or more five times in eight games, including 52, 43, 41, 48 and 59-point efforts. In head coach Turner Gill’s 7-year tenure at the school, Liberty has amassed a 16-6 record in the month of November. Virginia is now 1-9 in November under Mendenhall. The Hoos’ offense should have a great chance to get on track against a Liberty defense that surrendered 777 yards to Massachusetts last week and is yielding an average of 523 yards of offense – 285 passing and 238 rushing – per game. With the defense hobbled, the Cavalier offense will need to play well, establishing a strong running game and controlling the clock. Saturday figures to be an emotional day for the Virginia program, which will honor its senior players. Linebacker Chris Peace, running back Jordan Ellis and wide receiver Olamide Zaccheaus, players who have been instrumental in establishing the new culture under Mendenhall, are among the players who will be donning a Cavalier uniform for the final time in Scott Stadium. Game Time: Saturday, November 10, 3:00 p.m.
1. How healthy is this Virginia defense? The loss of Alonso makes an already thin defensive line even thinner, not to mention that the Miami native was playing extremely well. Even if Thornhill and/or Nelson can play, how effective will they be given their health? Let’s also not forget that inside linebacker is once again a question depth-wise with Malcolm Cook’s retirement and Rob Snyder missing last week. Virginia is banged up on all three levels of its defense. There remains talent in place on all three levels, though, and the unit should still be effective versus Liberty, but another injury or two and the Cavaliers could be in trouble against a fast-paced offense that has shown it can put up points. 2. Are new players ready for prime time? Coach Mendenhall made the point earlier this year that a player may be good for 19 plays, but if they are called upon to play a more expanded role, they may not be as consistent or productive. Bottom line, the player may not be ready for a bigger load. Because of the injuries, Virginia will need to turn to players such as De’Vante Cross (safety) to play increased roles. How will they respond? 3. Will the Cavalier offense find its rhythm? Quarterback Bryce Perkins and the entire Virginia offense looked out of sync against a Pitt defense that controlled the line of scrimmage. It’s important for the Cavalier offensive line to play the way they did in the previous three outings prior to Pitt. It’s important to establish Jordan Ellis and UVA’s core running attack, and it’s important for Perkins to find his rhythm running and passing. They should go three-for-three against a porous Liberty defense. If Virginia falls short in any of these areas, it probably doesn’t bode well for the final conference tilts versus Georgia Tech and Virginia Tech. The 6’2”, 180-pound Calvert, a junior, is in his third year as Liberty’s starting quarterback. While he is putting up big numbers in terms of passing yardage and has thrown 18 touchdowns, Calvert’s completion percentage is just okay at almost 56% and he has thrown 11 interceptions in eight games. His performance will make-or-break Liberty’s chances against the Hoos. 2. Wide Receiver Antonio Gandy-Golden. Calvert isn’t afraid to throw it up to his receivers and let them have a chance at winning those 50-50 battles. This is especially the case with the team’s leading receiver, 6’4”, 220-pound Gandy-Golden. Calvert lobbed it up to the talented junior three times on one drive last week against U-Mass, and Gandy-Golden came down with the reception all three times (including one touchdown). Gandy-Golden, who is averaging 120 yards receiving per game this season, is big, physical, and he has great hands and balance to make tough catches. 3. Defensive End Jessie Lemonier. Liberty has tallied 12 sacks the last two games, and the 6’3”, 240-pound Lemonier is responsible for six of them. He leads the Flames with nine sacks and 12.5 tackles for loss. 1. Running Back Jordan Ellis. Coach Mendenhall mentioned during his weekly Monday press conference that the running game needs to do better with its core running plays. Those plays, including Ellis runs up the middle, will help free up the elusive Perkins and others on the outside. Look for Ellis to be an emphasis for the offense on Saturday, and on Senior Day I fully expect a big day from the tough-as-nails senior against a defense that has exhibited poor tackling. 2. Wide Receiver Olamide Zaccheaus. Zaccheaus had only five touches versus Pitt. In his last home game as a Hoo, look for Zaccheaus to get touches in the run and pass-games and to finish with a big-time outing. Hall has been outstanding in this, his junior season. The Cavaliers will need him to have another big-time game on Saturday, especially if he is locked up with Gandy-Golden much of the day. Should be a great matchup to watch. Virginia won seven games in a season? It was 2011 and the Hoos captured victory no. 7 at home on November 12 against Duke. The Cavaliers used a 17-point third quarter to down the Blue Devils, 31-21.